• Regulates emotional activity: According to Traditional Chinese Medicine, emotions are linked to unhindered flow of Qi. When this flow is sluggish or stagnant, symptoms such as depression, moodiness, excessive worrying, belching or sighing may occur. An increase in Qi conduction creates increased emotions like headaches, anger, flushing, agitation or insomnia. • Aids digestion and absorption: Liver performs this function with the help of bile production as well as the ascending and descending function of free flow through spleen and the stomach. • Promotes normal flow of Qi, blood and body fluids: These three elements are in a constant state of flow. This depends on the physiological function of the liver, spleen, heart, lung, spleen and kidneys. The liver controls the volume of blood circulating within the body and performs the function of blood storage. This is regulated according to body requirements. There is more blood circulating during high levels of activity levels and more blood is stored during rest. Insufficient blood can lead to symptoms like limb numbness or scanty menstruation. Extra blood can lead to symptoms like hematemesis (vomiting blood), hemoptysis (coughing up blood), epistaxis (blood from nose), and excessive menstruation. For a healthy mind and body coordination, hun (soul) and shun (mind) must be in balance. They both take blood as their material basis. If less blood is stored, the hun can’t be housed leading to symptoms like hallucinations, fright, disturbed sleep, sleep talking and sleep walking. This implies relaxation and contractions of the tendons and ligaments are linked to the liver. A liver under stress can cause sluggish limb movements, numbness, impaired joint flexibility, spasms, and tremors. According to Traditional Chines Medicine, nails are the outward manifestation of tendons. When the liver has ample blood and is functioning at peak capacity, the tendons will be supplied with ample blood and the nails will get their nutrition. If liver is deficient in blood, the nails will be pale, brittle, soft, deformed (clubbing), and fragile. The liver meridians end in the eyes, so the eyesight and ocular system very much depends on liver health and circulating nutrients. Liver blood deficiency may cause blurred vision or night blindness. Similarly, inflammation of the liver leads to congestion, painful and itching eyes. Dampness in liver and gall bladder may cause yellow sclera. TCM treatment for cirrhosis of liver. “Ji Ju” (Aggregation) or “Gu Zhang” (Drum Distension) are the terms used for cirrhosis in TCM. 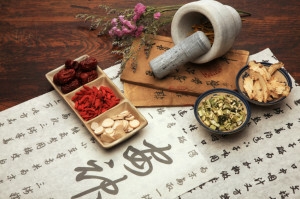 The purpose of Traditional Chinese Medicine is to prolong,strengthen and slow the compensated stage of cirrhosis to prevent progression into the decompensated stage or Late-Stage Liver Cirrhosis. Those in the decompensated stage may also benefit with various Chinese herbs to fight liver complications or help reverse the progression backwards to a compensated stage. Symptoms of loss of appetite, abdominal pain or bulging, belching, fatigue, agitation, nausea and vomiting are observed in this type. 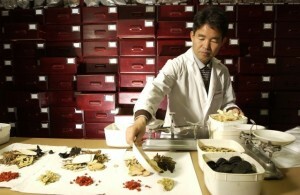 The Chinese herbs used to treat this type is Xiao Yao San. Symptoms of liver and spleen enlargement, spider angiomas on head, neck and chest, abdominal distension, stabbing pain and dark complexion are observed. This type can be treated with a combination of Jin Ling Zi San and Ge Xia Zhu Yu Tang. Symptoms of fever, irritability, bitter taste, thirst, dark urine, jaundice, sticky stools, constipation and rapid pulse may be observed. A combination of Zhong ManFen Xiao Wan and Yin Chen Hao Tang can be used to treat this condition. The symptoms of this type are milder in morning and worse at night. They include fullness and distension of abdomen, poor appetite, greenish yellow complexion, cold extremities, lower limb edema, fatigue, thin and weak pulse. Fu Zi Li Zhong Wan and Wu Ling San can be used if there is more spleen deficiency and Ji Sheng Shen Qi Wan with Wu Ling San used in problems with kidney yang. Enlargement and distension of the abdomen, prominent superficial abdominal vasculature, dry mouth, dull complexion and thin weak pulse are the symptoms observed in this type of liver deficiency . Yi Guan Jian and Ge Xia Zhu Yu Tang are Chinese herbs used for treatment of this type of cirrhosis of the liver. Cirrhosis of the Liver,depending on which stage of the disease may present, may even be healed,slowed considerably and the many side effects lessened by using a range of treatments form Western to Eastern treatment options, from modern day drugs, careful diet consideration, traditional Chinese medicine and Chinese herbs, acupuncture and health supplements and many more. Here, I have attempted to give you an idea of the possibilities Traditional Chinese Medicine can have on Cirrhosis of the Liver and that it has been used successfully to work with patients in conjunction along with these other treatment options.